My boy is a sweetie! You'd never know these are the same two kids who are constantly yelling at each other....well, not constantly, but a lot. In "public", however, E is so good to his "baby sister" and very protective. He takes good care of her and this makes my heart so very happy!!! Last week at the Y, he said to one of the big boys "look out for my baby sister"...so sweet! ..and a little humorous too, considering she is almost the same size as some of the big boys and can definitely hold her own. 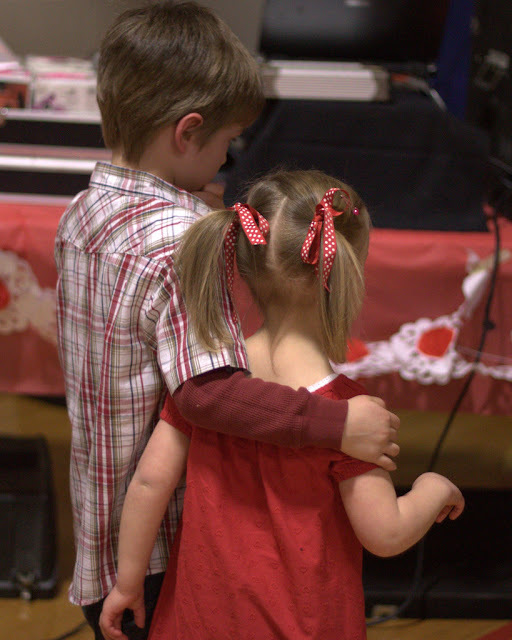 This was at tonight's Red and White Family Dance at E's school; it was a bit loud and crazy, but the kids had a blast, especially Little Miss. She made herself right at home with the big kids. After an hour, E was ready to go; I think it was a little too much for him. He was content and happy with having stayed for the hour. Did I mention that for almost the entire hour that we were there he was being chased by 3 girls from his class? That would wear any guy out, never mind a 6 year old. Both my babies were off to dreamland as soon as their little heads hit their pillows...Little Miss even fell asleep without her beloved Ellie. Now, that's tired!! !